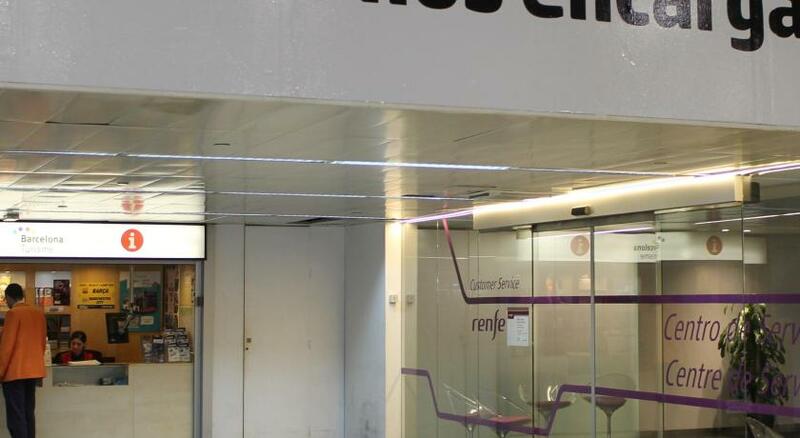 The location of the hotel was perfectly located right across the street from the Barcelona Sants train station. It was only a 15-20 minute cab ride from the airport ($35) and very convenient place to stay as we had a train to catch the next morning. The front desk was very nice and accommodating, allowing us to keep our luggage with them after check-out so that we could walk to an ATM and grab food. Felt safe walking around neighborhood and a supermarket on the same block of the hotel, cool park across the street to explore. Rooms were simple and clean, not outstanding, but fulfilled our needs and at the right price range. Had dinner at the hotel's restaurant, which was okay, the best part was the incredibly kind waitress and ability to charge to the room. Would definitely stay another time if taking the train in Barcelona! The room and bathroom were basic, but very spacious and clean. A perfect location to Sants. a enough space to put your luggage. Clean & modern room. breakfast at first was pretty good, then by mid week it really shrunk in offerings. Expo Hotel Barcelona This rating is a reflection of how the property compares to the industry standard when it comes to price, facilities and services available. It's based on a self-evaluation by the property. Use this rating to help choose your stay! 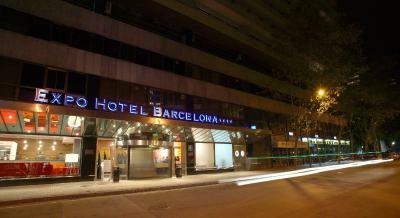 One of our top picks in Barcelona.Hotel Expo Barcelona is located next to Barcelona Sants Station. 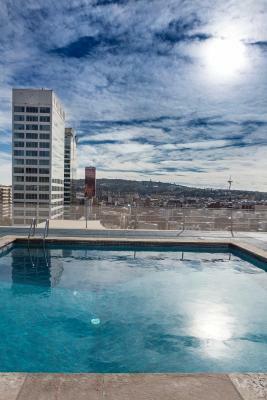 Its rooftop pool and terrace offer fantastic city views and the modern rooms feature a private balcony and satellite TV. 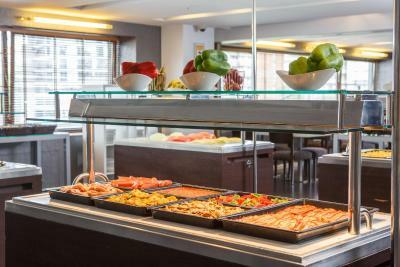 The hotel’s stylish Stopn’Rest restaurant serves international à la carte food. 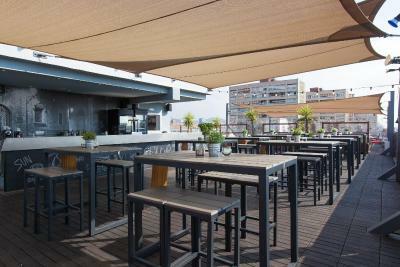 There is also a terrace bar in the rooftop chillout area, which provides views over Barcelona. 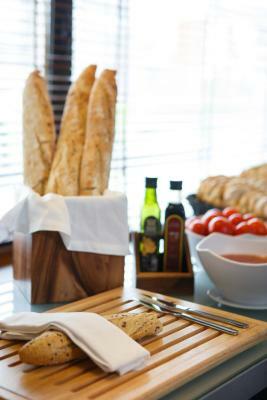 The Expo Hotel has 24-hour reception, allowing you greater flexibility during your stay. Bicycle hire is available to enjoy the city. 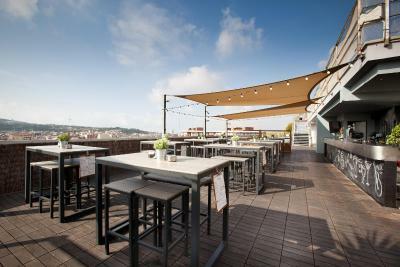 Montjuïc Hill, where you can find the Joan Miró Museum and Barcelona’s Fira Congress Center, is 10 minutes’ walk away. 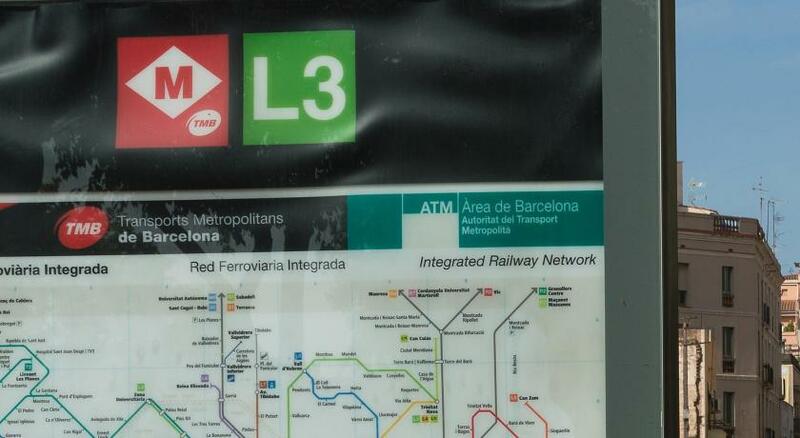 Barcelona FC’s Camp Nou Stadium is just one metro stop away. 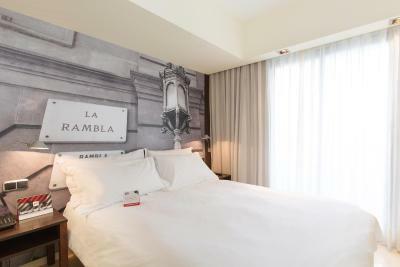 When would you like to stay at Expo Hotel Barcelona? Located on the higher floors of the building, this bright and comfortable rooms feature modern décor and have a balcony. The bathroom comes with free toiletries, bath, shower, and hairdryer. Public parking is available at a location nearby (reservation is not needed) and costs EUR 24.20 per day. Located on the higher floors of the building, this bright and comfortable rooms feature modern décor and have a balcony. The bathroom comes with free toiletries, bath, and hairdryer. This twin room has a balcony, air conditioning, free WiFi and satellite TV. The type of bedding, (two twins or a double), is guaranteed. This single room has a balcony, satellite TV and free WiFi. Located on the higher floors of the building, this bright and comfortable rooms feature modern décor and have a balcony, mini-bar, and air conditioning. The bathroom comes with free toiletries, bath, and hairdryer. This double room has a king size bed, balcony, and free WiFi. This twin room has a balcony, free WiFi and tile/marble floor. The type of bedding, (two twins or a double), is guaranteed. 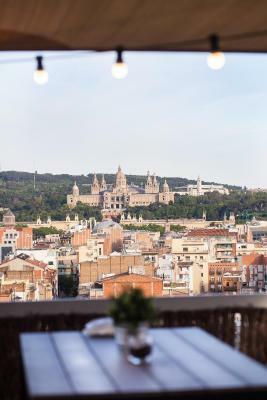 Explore Barcelona from a practical viewpoint, with an unbeatable location only one stop from the centre and perfectly connected with all Barcelona's tourist points. Also swimming pool with views, free WiFi and 423 bright functional rooms. House Rules Expo Hotel Barcelona takes special requests – add in the next step! Expo Hotel Barcelona accepts these cards and reserves the right to temporarily hold an amount prior to arrival. Please note that the rooftop pool and terrace are open from May to September. When booking 10 or more rooms, different policies and additional supplements may apply. The property will contact you accordingly. There was a nice restaurant that had a nice menu at reasonable prices but I was travelling with my 15yr old son who was not tempted to try anything different so we couldn't find anything he liked. On the other hand they had a nice room service menu of burgers and pizzas etc which ticked all his boxes but we were told we could only order from that menu if we had room service and not sit in the restaurant so I was a bit disappointed about that because it must have come from the same kitchen? Very nice hotel right by the train station. We had a little balcony and the room was spacious and clean. The reception staff were really helpful and we were able to check in a little early which is always a relief to lose the luggage. Looking at summer prices for this hotel I think we got a great price for the time of year and the facilities. room was tired and very basic. Not a lot of english TV stations that weren't news! Yellow water when I took a bath. It’s my 4th time in this hotel, I alway enjoy my stay but this time they give me 2 really old rooms. The smell in the 9th floor was not really good and in one of the room there was a really strong small when we enter. You can hear the noise from the others room and from the corridor. I booked 2 standard rooms and the pictures on the website were completely different. I was expecting the same kind of room that I got the previouly 3 times....but it was not the case. For sure with this rooms you can not consider it a 4 stars hotel. when we got to our rooms and tried turning on the air conditioner it wasn't working when we asked the front desk they said the air conditioner wasn't working, someone should have said something when we checked. Great location. Nice and attentive staff. Very old, run down facilities. I didn't feel comfortable enough to walk around barefoot. The rooftop bar, which was the only reason why I booked here, was closed. The hallways smelled of weed.